Fast and Easy training method. Save arround 150 € per year. Secure Payments Fast delivery. To avoid the cleaning agony… make your cat one more in the family! 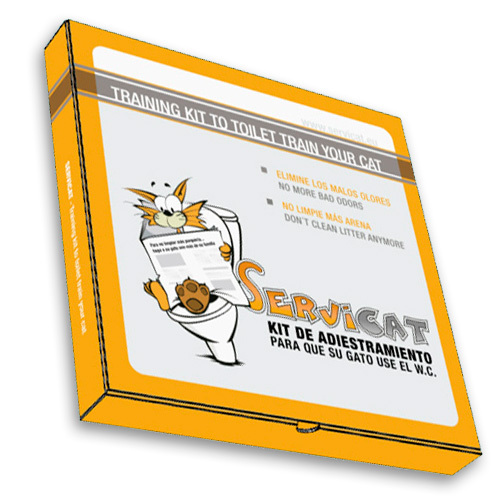 Servicat is a Traininig Kit for training our cat to use the toilet instead of the litter box. The system bears a series of small steps that allow our cat to change its behavior at its own pace. This system and the training method has been supervised by veterinarians and specialists in cat´s behavior. It´s based on the fundamental principle in which any cat buries its dregs to avoid finding its odor. If a cat can hide its odor in any other way it means that it can be taught not to bury. When a cat deposits its dregs in the water of the toilet, it satisfies its need to conceal the smell and consequently the reflect to bury becomes unnecessary. With Servicat your cat will become used to go to the toilet gradually and in a few weeks it will associate it as its natural place to deposit. Servicat´s main advantage is that the process is divided in 5 small steps in order to ease your cat´s change of behavior.